The Beatles 50 Years Ago Today: August 19, 1967. Beatles Radio: The Beatles, Solos, Covers, Birthdays, News The Fab 4 and More! 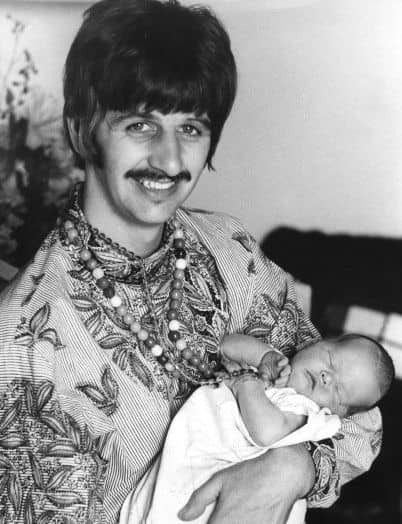 Ringo Starr and Maureen Starkey's second son, Jason, was born on 19 August 1967. He was the third Beatles baby after Julian Lennon and Zak Starkey. Like his elder brother, Jason was born in Queen Charlotte's Hospital in Hammersmith, London. His name was chosen by his mother. In later years Jason worked in the music industry, becoming a road manager and drummer. He once described his famous family as a burden, saying: "Being Ringo Starr's son is the biggest drag of my life. It's a total pain." In 1987 Jason Starkey was fined £125 after being caught stealing a car stereo, and two years later appeared twice in court on drugs charges. He played in a succession of bands including Buddy Curtis and the Grasshoppers, The People's Friend, Empire Of Sponge, and with his brother Zak, Musty Jack Sponge and the Exploding Nudists. Despite his earlier problems with drugs and the law, Jason settled down in England with his wife Flora and two sons Louie and Sonny.